The simpler, smarter way to get 100% new mattress sets with warranty for less - without compromising on quality. Try a new shopping experience that cuts out pressure and costs in our Eco-friendly mattress storage outlet stores. By Appointment Only. Same Day Delivery Available. If you need a new mattress set, don't pay hundreds more to experience a big showroom full of pushy salespeople. You can get the same or better beds for a lot less money and hassle. Contact your local Bargain Sleep Center mattress store today to set up an appointment. Bargain Sleep Center was founded by an industry veteran and Eco-advocate tired of the useless excess and costs forced on consumers by the big corporate furniture stores and mattress outlets. You don't need to pay hundreds more to fund a shopping experience most people find uncomfortable and stressful. There is a much simpler and more affordable way to purchase your next mattress, without compromising on quality or features. We've eliminated the wasteful energy costs, high rent, and advertising budgets you don't take home with you, so the bed you do take home is exactly what you want for a price no one else can touch. We offer 100% new, factory direct mattresses from our Eco-friendly zero-energy storage stores. We've cut out all of the ridiculous, unnecessary overhead, and we're passing the savings on to you - and the environment. Sleep even better on one of our new premium American made mattress sets knowing you saved yourself a lot of money, time and energy. Mattress store located at 3508 E University Dr in Denton, TX. Finally! No tricks, no pressure - just the highest quality new American made mattresses for the absolute lowest price - guaranteed. Get 100% new premium American mattress sets directly from the factory for a lot less - without compromising on quality, features or service. Try an informed, honest mattress shopping experience that cuts out the high prices, deception and pressure. 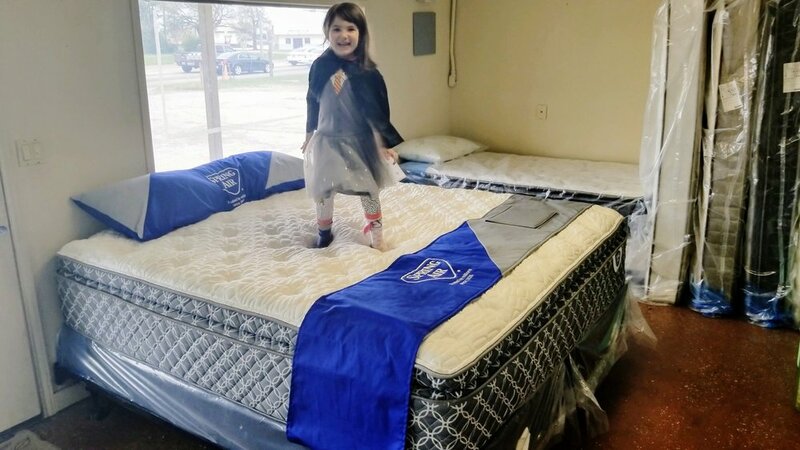 Schedule a visit to our family's local Eco-friendly mattress outlet today and save yourself a ton of time, money and stress. We don't compromise on quality or features, and neither should you. Our bargain prices come directly from our smart, ultra low operating costs, so we can sell the same mattress sets as everyone else for much less. We don't have commissioned salespeople, and we only open the store by appointment. No wasted time or energy means big savings. Bargain Sleep Center offers you the absolute best value for a premium American mattress set. You don't have to take out a mortgage to buy a mattress. If it takes 5 years to pay off, it better have the whole bedroom included. Don't fall into the trap of 'low' monthly payments and the corresponding high price, extreme penalties and hidden costs. Don't waste your time and money on a famous brand name - you should be paying for a mattress, not a label and an advertising budget. Our mattresses are made here in Texas in the same factories as many big brand names but without the big brand price tag. Same people, same materials, same designs - totally different prices and service. You never have to wait for another mattress sale! Our premium American mattresses are discounted below EVERY mattress and furniture store sale prices - EVERY DAY! Never used, never refurbished and never liquidated stock - we carry only brand new, factory fresh mattresses. You don't need to compromise to save! There is no need to pay hundreds more to experience a big showroom full of pushy commissioned salespeople. You can get the same or even better mattresses for a lot less money and hassle. Contact your local Bargain Sleep Center mattress store today to set up an appointment, and feel for yourself. Bargain Sleep Center was founded by an industry veteran and Eco-advocate tired of the useless excess and cost forced on consumers by the big corporate furniture and mattress stores. You don't need to pay hundreds more to subsidize a shopping experience many people find uncomfortable and stressful. There is a much simpler and more affordable way to purchase your next mattress, without compromising on quality or features. We've eliminated the wasteful energy costs, high rent, fat corporate structure, and expensive advertising you don't take home with you, so the bed you do take home is exactly what you want for a price no one else can touch. We offer 100% new, factory direct mattresses from our Eco-friendly, low-overhead mattress outlets. We've cut out all of the ridiculous, unnecessary parts, and we're passing the savings on to you. Sleep even better on one of our new premium American made mattress sets knowing you saved yourself a lot of money, time and energy. *Same day delivery applies to currently in-stock items at your local store. Free delivery is good for up to 20 miles from any local store. EXCLUDES BOX SPRINGS & FRAMES ORDERED WITHOUT A MATTRESS. Additional charges apply for destinations beyond 20 miles. Please contact us to confirm availability if you need your new mattress set today. All mattresses sold by Bargain Sleep Center are designed and made in tEXAS.